This is one of the most popular half day tours purchased at the Pearl Harbor Visitor Center. This affordable four hour tour includes the USS Arizona Memorial Narrated Tour, admission to the Pacific Aviation Museum Pearl Harbor and admission to the Pearl Harbor Virtual Reality Center. Regular priced at $42.50, you pay on $32.50, save $10 on each adult tour. Arizona Memorial Narrated Tour, admission to the Pacific Aviation Museum Pearl Harbor and admission to the National Park Service's Pearl Harbor Virtual Reality Center. 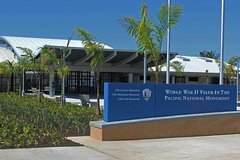 This package also includes free parking at the Pearl Harbor Visitor Center, a free map and guide of the Visitor Center and free transportation from the Pearl Harbor Visitor Center to Ford Island. Please plan 4 hours to complete all three tours.